A lot has happened since Lene Rønfeldt and Jeppe Vedel from LYNfabrikken in Aarhus came across the two designers Jetske Visser and Michiel Martens’ mechanical soap bubbles during Dutch Design Week in 2016. The two young designers and their experiments with shapes, movement and sense of space have certainly found a place for themselves, and the duo has over the past months received a lot of recognition worldwide. They have displayed their work at Wanted Design in New York and at Design Week Milan just to name a few. Now they are coming to Aarhus, Denmark, and they are bringing their mechanical oversized soap bubbles for the installation reflecting HOLONS. The installation examines the relationship between visual and material – as do a lot of their work. Martens & Visser create volatile, ungraspable moments, which at the same time are very real, specific and connected to the texture of the materials. With reflecting HOLONS it’s the organic softness and somewhat weightless expression of soap bubbles constituted by physical and very real materials and mechanics. 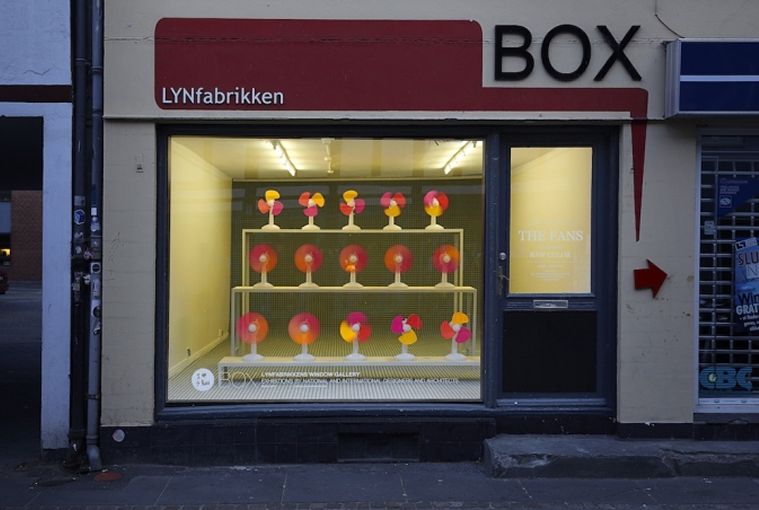 The works will be installed in the small art space BOX in Vestergade, in central Aarhus. The exhibition space is locked, but the single room with its few square metres and large storefront window means that passers by will have a view of the installation 24/7. Strips of foil mounted on a rotating motor create the illusion of the large soap bubbles. The combination of materials, physics and mechanics creates a relatively simple illusion with a complex effect. The motorized installation reflects light and colour and will look like large floating soap bubbles, continuously moving and changing shape. The installation can spark curiosity about materials in the contrast between the mechanical and the organic, and furthermore the soap bubbles can bring memories of playing with water and soap in the garden at home. But at the same time it’s physically impossible that it is in fact giant soap bubbles floating around in the small room – with no apparent human interference.